Directions: Craft an essay that analyzes the role of food/hunger in The Glass Castle. In her memoir The Glass Castle, Jeannette Walls tells the story of her non-traditional childhood. As part of this experience, she recounts many times when she and her family experienced a lack of food security. Consider both the times when the family experiences devastating hunger, as well as the moments when they connect with food. Then, in a well-developed essay, discuss the narrator's memories of food and hunger, and analyze how those moments contribute to the tone and the meaning of the text. Honors Seminar: Consider extending the conversation by including information from the supplemental resources (see below), and analyzing how that content connects with Walls' experiences. Throughout their youth, the Walls’ children experienced recurring bouts of food insecurity. Even in their elementary school years, Jeannette and her siblings were forced to adopt coping strategies, which included sneaking produce from the iceberg lettuce farm and pilfering food from various friends’ houses in order to ensure their survival. In one notable incident, the author recalls “slip[ping] back into the classroom and find[ing] something in some other kid’s lunch bag (68).” Her hunger was so intense that she was “barely able to taste” the food that she quickly devoured (68). Walls language suggests the shame and trauma she experienced due to hunger. Words such as “slip” and “gulp” hint at the embarrassment and desperation brought on by the family’s food insecurity, and the notion that “we kids usually kept our hunger to ourselves” only serves to reinforce the psychological effects of hunger. That shame and trauma continued to haunt Walls into adulthood, as she spent years hiding her truth from the world. Analyze how the author's choice of words, text structures, and point of view shape the meaning tone, and style of a text. 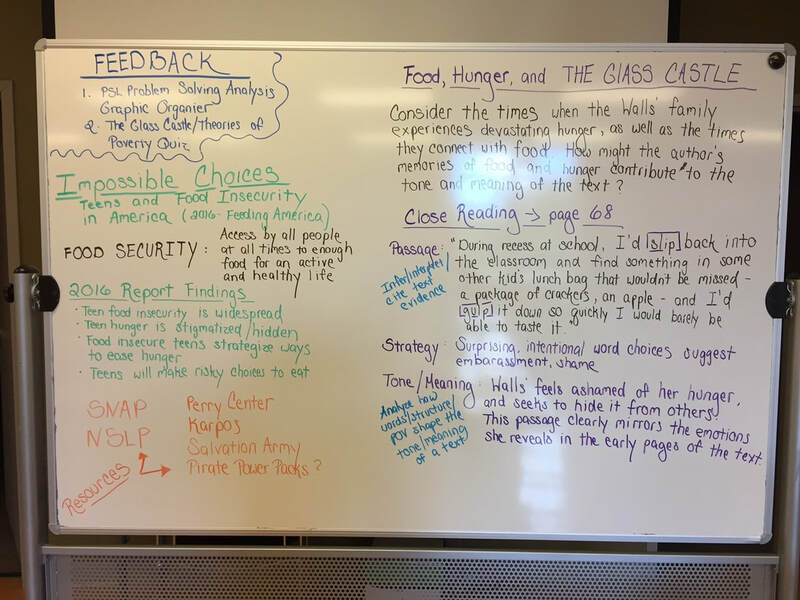 Directions: Complete the following guide in order to highlight and analyze issues related to food and hunger in The Glass Castle. Explore the SNAP and NSLP food assistance programs run by the United States Department of Agriculture. Then read the National Geographic article "The New Face of Hunger,"
Access the Urban Institute's 2016 publication "Impossible Choices: Teens and Food Insecurity in America" by clicking HERE. September is Hunger Action Month. Learn how to support the Greater Cleveland Food Bank's year-round efforts by clicking HERE. Learn more about the Perry Center, our community's local food pantry, by clicking HERE.